It's no newsflash that the 80s are back -- even street corners in remote Wyoming and North Dakota are swimming with hipsters clad in acid wash jeans and neon raybans. But if there's one thing I have learned while couch bound and channel surfing in my cocoon for these past six weeks, it's that there is a kinder, gentler 80s aesthetic out there. One that might best be described as... mature. For those golden years. Because you know Kelly Wearstler was totally channeling Blanche when she masterminded that mix; note the color/texture similarities between the GG's tablecloth and KW's wallpaper. The lesson here is that mauve is scary, and mauve plus any kind of blue is even scarier. But did you see the GG's Chinese Chippendale chairs that have been splashed on the pages of every single shelter mag for the past few years? I'm pretty over them, but if you're gonna go that way, might as well go over the top. Yes, I admit it. I do love me some neon. Yes, that uber 80s Karl Springer nightstand would be right at home in Dorothy's bedroom. Sorry you need Sophia's bifocals to see it. 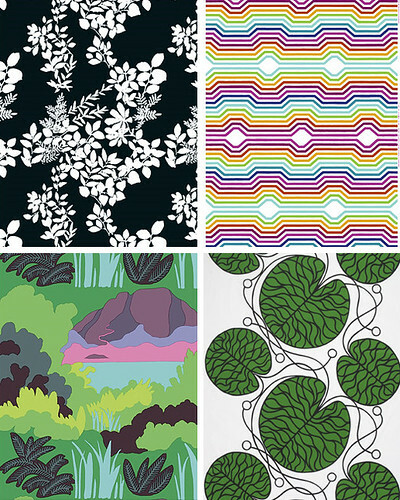 I pulled these from Marimekko all quick like, but anything bold and bright would do. I'm thinking rattan needs a festive print to stay true to its tropical origins, but instead of faded pink I prefer a crisper color scheme to bring the shape and texture up to date. 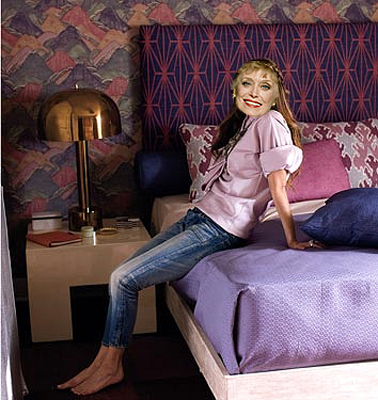 Everyone in the world has seen the inside of Blanche's bedroom. Perhaps she fancied herself a tigress, hunting silver foxes in the jungle of love. Eeeeeeew. 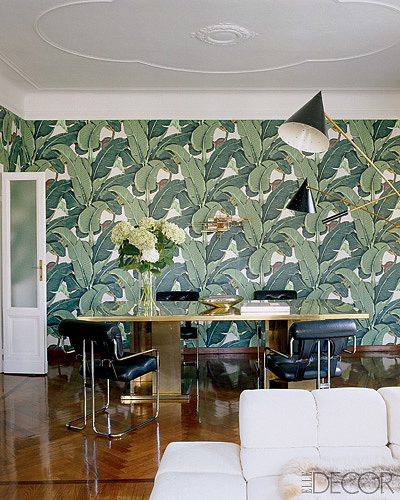 Whatever the case, that banana leaf wallpaper is springing up in well heeled homes everywhere and I probably should be tired of it, but I'm not. However, I'm not sure I love Nicky Hilton's full monty interpretation here. 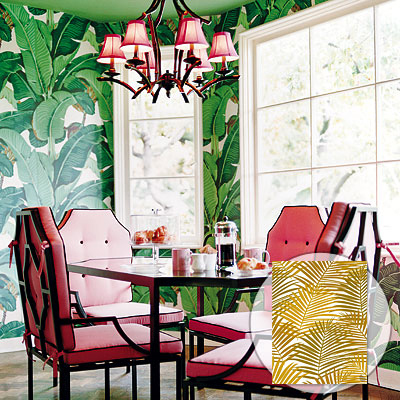 It's pink, it's got chinese chippendale-esque chairs, and it has the wallpaper. Despite all the color, it feels kind of old to me. 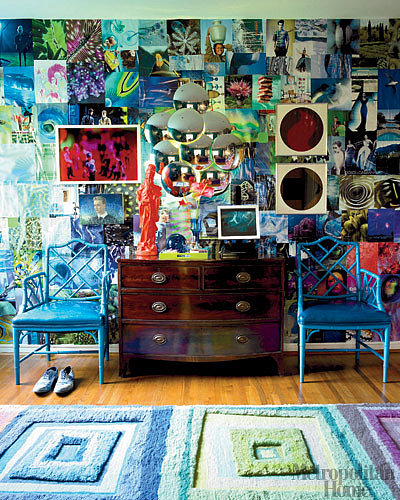 I blogged about Nate Berkus' apartment before, and I still want to go to there. 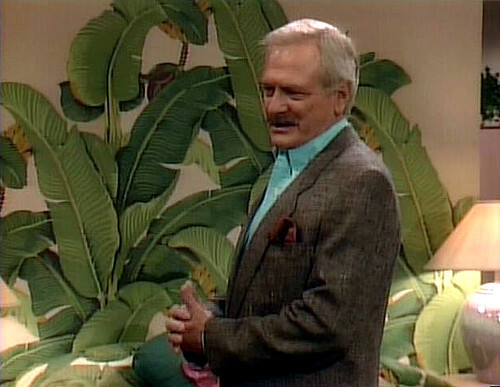 He keeps the furnishings muted to let the wallpaper harmonize with -- rather than contrast with -- its surroundings. Because that's some big wallpaper, you know? 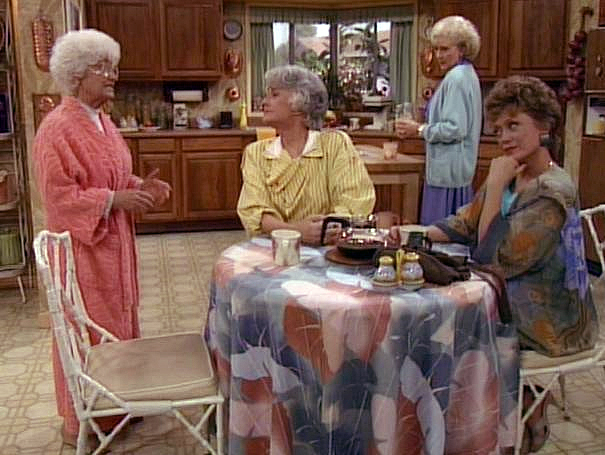 Now that I'm back blogging, I'm going to miss my time with the Golden Girls, but I'm so happy to return to say THANK YOU!!!! to all the people who filled in for me while I was gone, and to all the people who read the blog. And I especially want to thank Karly for holding down the fort with style and grace. A girl really couldn't ask for a better friend. This post be dedicated to you. I'll be back on Friday with... something. But in the meantime, stay gold. Apparently this incredible tat belongs to a friend of a friend. Only in Austin, people! 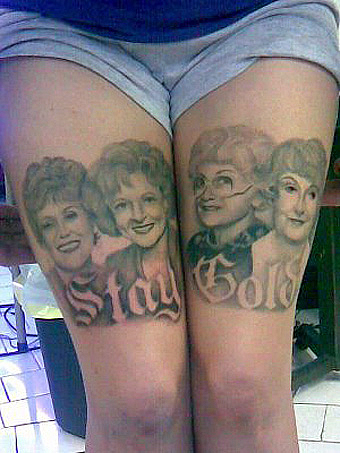 Who better to spend the rest of your years with than Blanche, Rose, Sophia and Dorothy, I say? I call Rose. 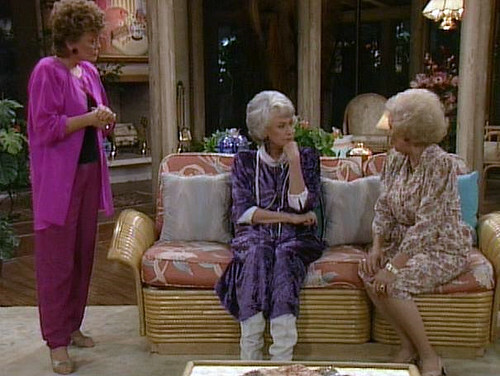 Which Golden Girl are you?